Lysa & Huey Ink! 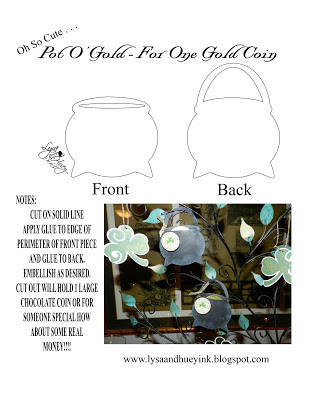 : Saint Patrick Day Is Coming! With Valentine's Day behind us and a very cold 3 day weekend, I took a moment to take down my little ode to Saint Valentine and bring in Saint Patrick. It was easy because I only do a small display on one side of the living room. While I was doing that, Rory was busy putting up Easter everywhere else! I must say it is nice to see some signs of spring. 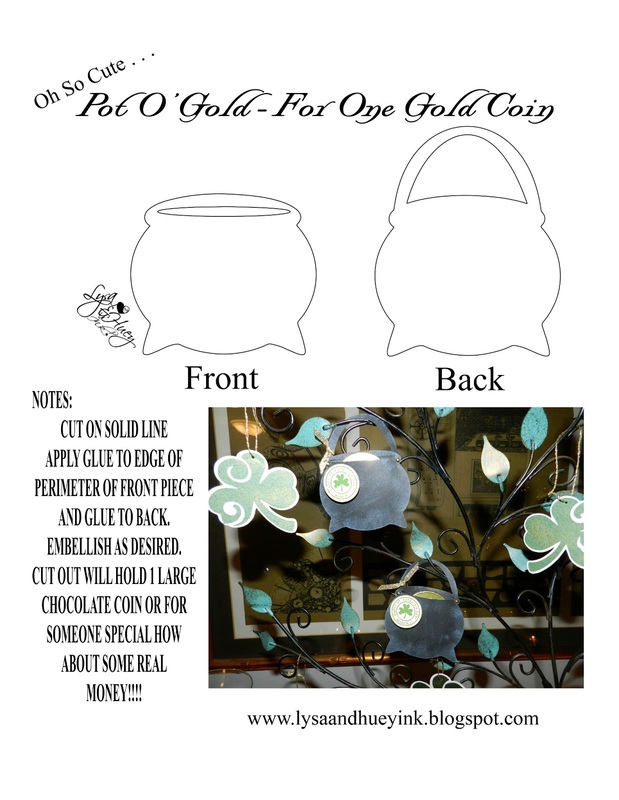 With that said I had time today to get going with a bit of St. Pat's magic and created my little favor for the work peeps and anyone who stops by here at the house on parade day. (parade day is very big here where we live) It really is one of my most favorite days of the year. We can only leave the house on foot as we are blocked in due to the parade. In my "younger" days I was out there right on the parade route cheering and acting up . . . now I just hunker down and make the corned beef, cabbage and fixen's for a great dinner at the end of the day. I thought I would share this little file with you all. I just love how cute they look hanging on my Hallmark tree. You could mount the Pot O' Gold to the front of a card. As you can see I used my favorite tag that is a stamp from SU. I really need to make a new graphic as I use it all the time. Here is a picture of the file so that you can see how easy peasy it is to make. I hope you give this little cutie a try, it is quick and easy also keep Halloween in mind because I am so seeing a witches cauldron too! Thank you so much. I love all your files that you share.